After a season with more ups and downs than the EastEnders Christmas special, Rangers fans will finally get the chance to party again as they lift the Division Three trophy in front of a sell-out Ibrox Stadium on Saturday. It might not have been pretty, it might not have been impressive and it might not have been particularly graceful, but Ally McCoist’s men have got the job done and earned the right to celebrate in front of a support which has suffered more than most during the last 18 months. 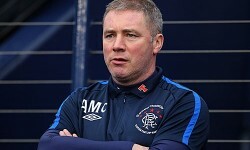 And while the fans can look forward to trips to Ayr, Stranraer and Airdrie in Division Two next season, Saturday will be all about the here and now, and ensuring that they leave the fourth tier with a bang just nine months after being bundled in through the back door with a jacket over their head following the ignominious financial collapse. Hoping to poop the party are Berwick Rangers, a side who must avoid a heavy defeat at all costs as they look to protect a crucial three-point and eight-goal advantage over rivals Elgin City in the battle for the final play-off spot. Under normal circumstances, such a lead would be considered almost insurmountable with just one game to play but, with Rangers looking to put on a show, Berwick’s collective bum will be squeaking at the prospect of an embarrassing collapse. They will take comfort from the fact that Rangers haven’t scored four goals at Ibrox since February and haven’t hit five or more in the league there since September. An outcome of fewer than 2.5 goals in the game, on offer at 7/4, would suit Berwick down to the ground, as would fewer than 3.5 goals, available at 7/10. A point, which would mean the visitors kept their play-off destiny in their own hands, is priced at 17/4, compared to 1/4 on a home win and 29/4 on a party-crashing away triumph. The best bet in this one, though, could be backing both teams to score. The Borderers have scored in all three meetings with Rangers this season and you will get odds of 7/10 on both teams scoring again in this one, compared to odds of 21/20 on one or both teams firing a blank. New customers to bwin who sign up online qualify for a free £20 bet and using that to back this outcome will return £34 if successful. Whatever the score, however, it seems likely that the two Rangers will be holding a joint party inside Ibrox come 2.30pm on Saturday. Bale lands football writers’ gong…will he toast it by sinking Southampton? Nottingham Forest should beat Leicester…but will it be enough?